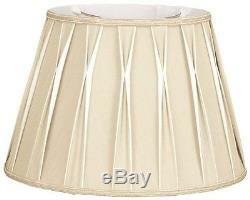 Royal Designs DESIGNERS LAMP SHADE Bowtie Pleated Drum- BEIGE, 18 DS-7-18BG/WH. This Bowtie pleated drum designer lampshade is a part of Royal Designs, Inc. Timeless designer shade collection and is perfect for anyone who is looking for an elegant yet detailed lampshade. Royal Designs has been in the lampshade business since 1993 with their multiple shade lines that exemplify handcrafted quality and value. Exterior fabric: hand tailored silk-type shantung (except linen fabrics). Interior fabric: off-white softback lining (black and other colored fabrics have gold lining). Washer: standard brass-finish spider fitter, use a finial to fasten shade. (All SHADES with 9"+ top diameter have a v-notch fitter for use on a 6" or 8 reflector bowl). Trim: top and bottom designer trim (single, double or braided) with vertical piping. Frame: heavy grade rust resistant metal frame. Bulb: suggested maximum wattage is 150-watt for most sizes (clip on shade Max 60W). HEIGHT is measured by slant HEIGHT from top to bottom of the lampshades' front face please measure your existing shade--a Replacement harp may be needed for a proper fit or additional ADJUSTMENT if changing HEIGHT of shade. Note: This is a Special Order Item and will take approximately 2 weeks to order. 11 x 18 x 12 (Top x Bottom x Height). Fabric: hand tailored silk-type shantung fabric, premium off-white softback lining. (Shades with 9"+ top diameter have a v-notch fitter for use with a 6" or 8 reflector bowl). Frame: heavy grade 1.5Mm rust resistant metal Frame. Thicker than typical standard lamp shades. 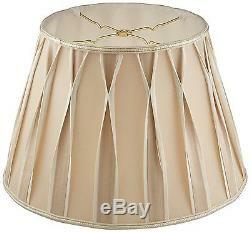 Royal Designs DESIGNERS LAMP SHADE Bowtie Pleated Drum. 11 x 18 x 12. Indoor use only, General purpose. Brand Name: Royal Designs Inc. Photos are for illustrative purpose only. Express Post is an optional extra. In most circumstances direct contact between yourself and Australia Post will result in the most efficient resolution. The item "Royal Designs DESIGNERS LAMP SHADE Finial Pleated Drum- BEIGE, 18 / 46cm" is in sale since Saturday, April 08, 2017. This item is in the category "Home & Garden\Lighting, Fans\Lamp Shades". The seller is "itsalovelydayforshopping" and is located in Robina, Queensland. This item can be shipped worldwide.